our hearts are broken by the hate that seeped into the Emanuel AME Church on Meeting street wednesday night. but our community is strong and caring and we will band together to overcome this horror. intolerance is a disease that cannot persist! our hearts and prayers go out to all the families directly affected by this tragedy. peace and love south carolina. « aaron draplin stopped by our town. the world is all good now. Gil – this is just beautiful. Great work. Would love to have a girlfriend make up some tshirts to promote prayer for South Carolina peace & for Emmanuel A.M.E. with your logo on them. If name credit is given, would you be ok with this? Or a cost you would need to give the right to use this? Also…. this would not be for mass sales. .. we are talking 5 tshirts tops…. but I guess if it caught on, the lady who screenprints would get in touch to cut you in or buy the rights. I wouldn’t be in the mix at that point. I have my own full time job, too! Lol! This is phenomenal … you are some talent. The good people at Emmanuel choose the path to forgive and go forward. This speaks volumes about this congregation, the City of Charlestion and most importantly, the State of South Carolina. I am in awe but not surprised. I am so proud to call South Carolina my home. Will this design made into a vinyl sticker? If so, can you tell me where to purchase them? I live in NYC and would love some pins with this design, many people are watching in NYC and want to wear this on their clothing. Are you the creator of this beautiful tribute? this is so quietly and subtly beautiful. Making it my profile picture. Beautiful way to honor the nine. Gil! It’s your old neighbor from Shemwood, Vicki . I love, love this design!! Let’s do T-shirts!!! I will so buy some!! Wonderful. Thank you for creating this. May we share your image (with credit, of course.) It is so powerful. Namaste. Sweet! Tweeted a s/o to you guys. Where can I buy gear?!? Beautiful and heartfelt..I would like to buy one. I love your palmetto design with the doves. People are putting it on their facebook page. I would love to have a shirt with this design. I bet embroidery people would like the design to work up on their embroidery machine. Is it for sale? Most of all thanks for making it. It hit me hard when I saw it! I would love to be able to purchase this print. Is it available with proceeds going to Emmanuel AME?? Hi, I would love to use your design on a sign supporting Charleston . if you could please give me your consent . I will be donating to the families . thank you. Thank you for the design. I hope you will feel honored that I am using it as my FB profile through Sunday and that I suggested it to a few others as well. I attached a link to it from my page. Thank you for using your skills for good. I LOVE this image! Do you have it available as a car decal? I’d love to buy one!!! Love this design. Will you be selling prints of it? 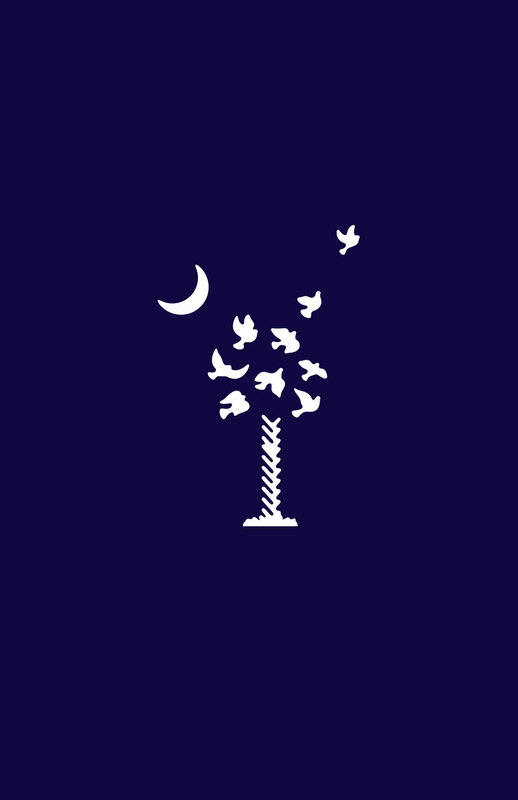 please have tshirts made with your design of the “dove- metto” tree to help the church and families of the Charleston shootings!! Please let me know how I can help in the upstate! Thank you for this beautiful tribute! We in Charleston want it for our cars and elsewhere. Can this happen? please let me know if I can use this graphic! Beautiful work! Is this, “We shall overcome”, available on a shirt? I would love to purchase this if it is. Or possibly a window decal? Really, any way to show my love and support, I’d buy it. Thank you for this beautiful tribute to the victims. It is absolutely perfect. This image so well represents my sentiments in the wake of the shootings. We in SC need to rise up I. Spirit to overcome the racial barriers that exist, undermining the ability of our state to move forward in the interest of ALL our citizens, to be the best we can be. Might we use this image – citing you, of course, on a prayer insert we will be using in worship tomorrow at Church of the Good Shepherd, Lookout Mountain, TN? Thank you for creating such a touching piece in memory of the Charleston 9. Love, compassion and unity is type of emotion that should be evoked by anything that represents EVERY resident of South Carolina. Thank you! Beautiful, powerful graphic. Thank you Gil !! this is amazing. Beautiful, thoughtful, it says so much. I wish I had the bumper sticker, the shirt. This says it all. Thank you. This design would make an awesome shirt! Are you going to print any or may I have permission to have it printed at my local tshirt maker? I’ve never had a piece of artwork touch me the way this has. It’s probably one of the most humble representation of hope for our fine city . I’m touched every time I see it shared. I do hope to see this extraordinary piece of art draping our fine city in the near future . Thank you, Gil. Powerful and beautiful. Like our community. Lovely, A fitting tribute. Thank you. This is such a breath taking design, it speaks volumes!!! Any chance to get the rights to reproduce it? I would love to start a fundraiser for the victims families and the church. So grateful to you for this heartening image, Gil! I posted it on my FB page and am now trying to figure out a way to make it my profile picture. To me, it’s even more comforting and hopeful than all the verbal lamentations and opinions about how to make it all better. From a deeply saddened native South Carolinian watching it all from California. Thank you. Makes me proud to have sampled the dog w/you once or twice upon a happier time. Your art will help in the healing. Gil, your powerful graphic speaks to my heart and soul. Thank you for your great talent and generosity. This is such a powerful image! You are brilliant (as well as quick)! This could not express our feelings here in SC any better. Gil, this is such a beautiful and powerful image! Thank you for creating it and sharing it. i would like information about purchasing your fabulous graphic on t- shirts. I will be chaperoning youth to the ELCA national gathering in July and we would love to wear your inspirational shirt. Awesome graphic! Our quilt guild is working on quilts to share with affected members of the church. Could we use your image in the quilts, or on a flyer to garner sewers support in making these quilts? Would be more than happy to credit you in the flyers, web, and facebook, a little more difficult in the quilts, but could be included in a card when the quilts are delivered. Trying to figure out how to take the first comment down, will pm you. If I digitize this could I get your permission to use it?I have a small embroidery business. I just want this design as a shirt or bag in support of those families who lost their loved ones. This image is so simple, yet so powerful. I have had a couple of folks that I know inquire about purchasing shirts, decals, etc. bearing this symbol. This image is so powerful! I would love a t-shirt with this on it. Any chance? If you get permission to do this, I would love to buy one. Beautiful, and it says so much. Sometimes a picture really is worth a thousand words. Your artwork inspired me to create some WordArt incorporating your design with the names of the Emanuel AME Church victims. I posted on my blog. I hope this is okay, as it is meant to inspire & is not for any profit. If I need to remove, please contact me. Thank you so much for honoring the Charleston Nine in such a beautiful way. God bless.. SC native presently living in New York. I wondered if I could buy a vinyl window sticker of this from you (no background, just the tree of doves and moon)? I have been looking for just the right SC “flag”. This would be so beautiful on my new blue car :-). Thank you for your time and efforts and beautiful work. try ebay. i think there is some there. May I use this image as my facebook picture? It captures my love of SC, my love of Peace, and the angels that were used by God to turn hate to love so perfectly. Thank you for creating it! Love and appreciate your work to remember these special people. I would love it if you could share your image, have just starting working with a silhouette, will try to make a car decal for my use. Thank you for your time. Great design. Too bad the symbol in the upper left corner is in the shape of a crescent moon. Our state flag does not have a crescent moon on it. Look at it carefully and you’ll see that the points are too close to be a crescent moon. It’s a gorget, a piece of armor worn around the neck to protect the chest. It was a common symbol in the 1700s when Moultrie designed his flag. Gil, We love your design and wondered if we could use it for some quilts we are making for the nine families from Emanuel. Many of the squares for the quilt are being created by children in five local churches, a calligrapher has added fifty squares of messages and quotes from the hymns and Obama’s speech, other artists have contributed their work, and a number of quilters and seamstresses have volunteered to piece the quilts. This really is an organic community effort, and many have expressed a wish to see your artwork included. We hope that is possible! I would like to use your artwork on my FB page to honor the victims. Very beautiful and thank you. I think this would be great on license plates. I would definitely buy one! I would love to buy T-shirts and a decal for our car. Thank you Gil for designing this. It really hits the spot. is anyone selling t-shirts of you ‘we shall overcome’?